The PWL device, system, and method used to measure level and flatness are protected by U.S. Patents 9,587,940 and 9,273,988 “Precision Hydrostatic Level and Flatness Measuring Device, System and Method”. The PWL-2 is protected by these patents and elements specific to the PWL-2 are patent-pending. The use of any tool to measure level or flatness according to the methods recited in our claims that we (EDS Precision Systems or Equipment Development Services) do not manufacture infringes on our patent, regardless of the reason the tool was created. It’s also important to know that we haven’t authorized anyone else to make, sell, advertise, or import the tools recited in our claims. Owners of our PWLs are granted a license to use our method only for a PWL device we manufacture. For example, if you purchase an eight-cup PWL kit, with a second micrometer assembly and four additional cups that we made, you are receiving a license to use our method to conduct one level or flatness measurement at a time per micrometer assembly at one measurement location per cup, so in this case two measurements at a time at twelve measurement locations. In other words, we’re selling a tool that should not be copied. Never purchase any duplicates or knock-offs and please let us know if you come across any. While we will rigorously enforce our patent, we hope to avoid this by offering great value through low prices, excellent customer service, and a high quality tool that often pays for itself within one or two uses. To learn more, visit our PWL page. This entry was posted in PWL on December 23, 2016 by eds55precsys. 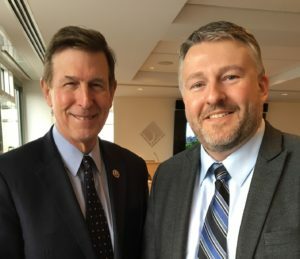 I had a great meeting with Congressman Don Beyer’s office on December 2, 2016 and I met the Congressman on December 5, 2016 (he’s on the left). On both occasions, I relayed small business and manufacturing concerns, such as workforce challenges, intellectual property protection, and utilizing U.S. made equipment and tooling on government contracts in addition to utilizing U.S. workers. He was very interested, in part because we are one of the only manufacturers in his district. I’m hoping to have additional conversations with him or his office as topics relevant to U.S. manufacturers arise. This entry was posted in Uncategorized on December 20, 2016 by eds55precsys.